On Wednesday night one of Europe’s biggest football matches was being played. But it was no Champions League fixture, rather it was the Derby Della Madonnina in Milan which saw AC Milan and Internazionale clash in one of Europe’s true titanic matches. As always, the atmosphere inside the famous San Siro was fantastic with both sets of fans unveiling stunning choreography. The game itself was largely dominated by Inter, starting the night in fourth, while Milan, eight points behind Inter prior to kick-off, had to adopt a more reserved, counter-attacking approach due to Inter’s strong performance. In the end the game finished 0-0 after Inter missed some huge chances but Milan also had some good chances which weren’t capitalized on. It leaves Milan out of the race for a Champions League finish while Inter remained in second, two points ahead of Lazio in fifth and one behind Roma in third, which leaves the race for the two spots behind Juventus and Napoli wide open. Tactically, it was interesting to see how Inter coach Luciano Spalletti set up Inter in possession, which led to them dominating midfield. There were other tactical take-aways too. Let’s take a look. Gennaro Gattuso chose to continue with the 4-3-3 formation which has been the basis of Milan’s revival under the leadership of their former midfielder. His lineup read as follows: Donnarumma; Calabria-Bonucci-Romagnoli-Rodriguez; Kessie-Montolivo-Bonaventura; Suso-Cutrone-Calhanoglu. Defensively it became 4-1-4-1 while in attack Calhanoglu and Suso often made inverted movements to create more of a 4-3-2-1 with Calabria and Rodriguez attacking the flanks. One key aspect of Milan’s positions in attack is the combination between Bonaventura and Calhanoglu who would often swap positions with Bonaventura moving wide and Calhanoglu coming inside. Spalletti has used a 4-2-3-1 formation throughout the season but surprised by deploying a a 4-4-1-1 when defending which then turned into an asymmetric 3-2-4-1 in attack, which I’ll come to later. His eleven was: Handanovic; Cancelo-Skriniar-Miranda-D’Ambrosio; Gagliardini-Brozovic; Candreva-Rafinha-Perisic; Icardi. The tactical aspect that intrigued me the most was how Spalletti changed Inter’s shape when attacking in a controlled manner from the defensive 4-4-1-1 into an attacking shape which is best described as an asymmetric 3-2-4-1. Spalletti did this by having the right-back Cancelo pushing up down the right wing with right-winger Candreva moving inside into the right half-space. Candreva’s position then saw Rafinha shuffle across to the left half-space to form a midfield box with the deeper positioning of Gagliardini and Brozovic. On the opposite side, left-back D’Ambrosio was more reserved than Cancelo on the right, but didn’t stay as a third centre-back but instead played as a more defensive left-back, although he did often attack down the left wing when the space was available. Ahead of him, left-winger Perisic hugged the touchline unless D’Ambrosio pushed on, then the Croatian would also move inside. As you see above, Candreva has moved inside from the right to create a midfield box with Rafinha, Gagliardini and Brozovic. Cancelo and Perisic (both in yellow) provide maximum width while D’Ambrosio (blue) occupies a traditional left-back position with Skriniar on the ball to the right and Miranda more centrally (just out of shot). These movements created a 4 vs 3 numerical advantage for Inter in midfield and highlighted an area they consistently locked to exploit; the half-spaces either side of Montolivo behind Bonaventura and Kessie. In the below image, we can again see the 4 vs 3 scenario Inter create in midfield with Candreva and Rafinha again picking up positions from where they have positional superiority against their opponents. The half-spaces behind Kessie and Bonaventura either side of Montolivo was, along with the wing spaces, the spaces Inter looked to exploit. In this regard it was interesting to see Spalletti use Candreva in such a role given he’s always played wide on the touchline to whip in crosses. In many ways, he’s often acted as one of the most linear players you could imagine. But Candreva showed good understanding of space and linked up well with his teammates from a more central role. That Rafinha would thrive in this role was less surprising with the former Barcelona midfielder excelling throughout with his ability to find space and pick up the ball with his body already facing forward. This ability kept Inter on the front foot when Rafinha was fed the ball as he instantly attacked the Milan defense and could give Perisic 1 vs 1 opportunities quickly which maximized the space available to the Croatian down the left. Below we see Inter’s plan. Kessie is attracted to Brozovic while Rafinha has already positioned himself behind Kessie and to the side of Montolivo with a lot of space to turn and attack. Spalletti had evidently read Milan very well since Milan’s pressing, which I’ll look at later, often sees Kessie and Bonaventura leave midfield and join Cutrone in pressing thus vacating space behind them. Milan really struggled to adapt to Inter’s numerical advantage in midfield and the positioning of the attacking midfielders, which can again be seen below when the substitute Borja Valero picks up the ball with acres of space. Inter under Spalletti have been a very wing-focused side and the derby was no different with Inter causing trouble for Milan down both sides, but especially the left with Perisic in good form. 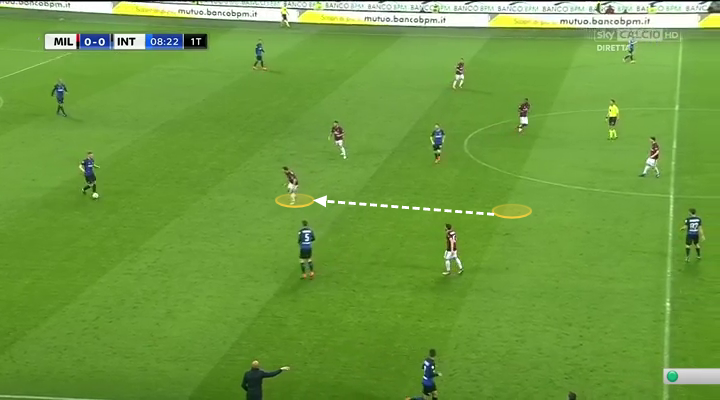 The 4 vs 3 advantage in midfield forced Milan to center their midfield even further, leaving lots of space down the wings where Perisic often enjoyed 1 vs 1 situations against Calabria. Inter often looked to progress play with diagonal passes out to the wings early, like in the image below when Inter beat a poor Milan press to find Brozovic who then sprays the ball wide left to Perisic. I’ve already mentioned Milan’s normal pressing scheme under Gattuso which sees one of the outer central midfielders, Kessie or Bonaventura, leave their position in midfield to join Cutrone and create a front two when pressing the centre-backs. They tried the same approach against Inter but were unsuccessful, partly because they were outsmarted by Spalletti, but also because their back-up to the first line of pressure was extremely poor. When you try to press high, you need to make sure you have a second and then third line of pressure in good positions to support the initial press, but Milan lacked this and thus their press was often broken easily. Below is an example of the way they looked to press Inter’s centre-backs. Bonaventura leaves his position in midfield and joins Cutrone in a front two when pressing. The problems Milan had in making their pressing successful can be seen below as Miranda easily breaks the press by a simple pass to Brozovic. The Milan duo have no back-up behind them which gives Brozovic enormous space to tun into and he can then progress Inter’s attack down the left. Here’s another example. Skriniar breaks the pressing duo of Bonaventura and the substitute Nikola Kalinic by his pass into Brozovic. Montolivo and Kessie (both highlighted in red) are too far away from the Croatian to put pressure on him and it’s easy for Brozovic to then find Rafinha or Candreva in a lot of space either side of Kessie. These struggles of Milan to block of Inter’s access to their midfielders where Brozovic was excellent in dictating play led to Inter then dominating possession and forcing Milan to defend for long spells. In hindsight, it would have been smarter to drop deeper and keep a more compact shape and make it more difficult for Inter to dominate the ball. Inter’s pressing was often more synchronized and often stopped Milan from building attacks. The scheme was that Icardi picked up Milan’s ball-far centre-back and the ball-near winger would press the ball-near centre-back. Rafinha would pick up Montolivo while Gagliardini and Brozovic moved up to Kessie and Bonaventura. Donnarumma was therefore often forced to play the first pass out, and his passing isn’t the best which often saw Inter regaining possession in the middle third by winning aerial duels or by forcing a mistake by one of the defenders. When Milan had a more controlled build-up and found themselves in possession higher up the pitch, Inter settled into a 4-4-1-1 shape which focused on keeping the team compact both horizontally and vertically to force Milan wide. Rafinha had a key role to play as he often started behind Icardi and basically marked Montolivo, but would then press the centre-back Icardi wasn’t and use his cover shadow to block off passes to Montolivo. Milan did however found ways around this at times. The most often used method was bounce-passes from the other midfielders into Montolivo who then found himself in plenty of space. One example is imaged below as Rafinha presses Bonucci and uses his body to block a pass into Montolivo. Bonucci’s pass finds Kessie who lays it off to Montolivo who can then continue the attack. 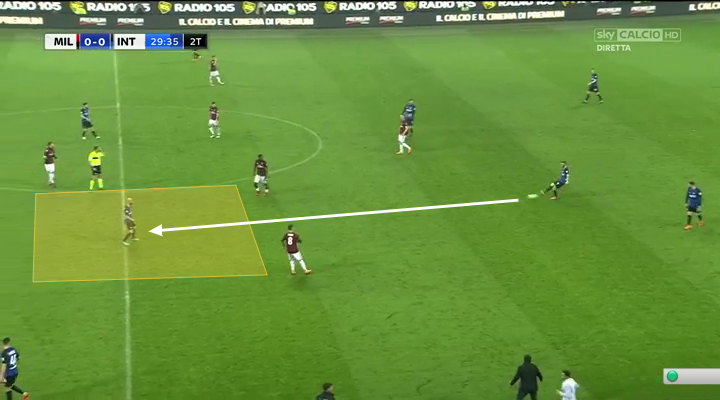 Another area Milan used to find space in Inter’s otherwise compact block was by having Suso move into the right half-space behind Brozovic to pick up the ball. This rarely happened, but one occasion when it did can be seen below as Bonucci threads a pass through to the Spaniard after Brozovic has been attracted to Kessie. More often than not though, Inter would succeed in the way they defended and restricted Milan’s chances to either coming from a set-piece or a counter-attack. An example of their compact block can be seen below where they force Milan wide and prevent central progression of the ball. Milan vs Inter is always an entertaining match but in terms of goals this clash didn’t live up to the derby in October when Inter won 3-2 thanks to a Mauro Icardi hat-trick. Spalletti clearly won the tactical battle against Gattuso but the 0-0 draw didn’t suit either coach as Inter missed the opportunity to leapfrog Roma and move into third while Milan basically lost all hopes of finishing in a Champions League place. For Inter that chance still exists, and it would be great to once again see just one of these giants back in the finest club competition.